Zach goes extreme biking with his new Christmas present. 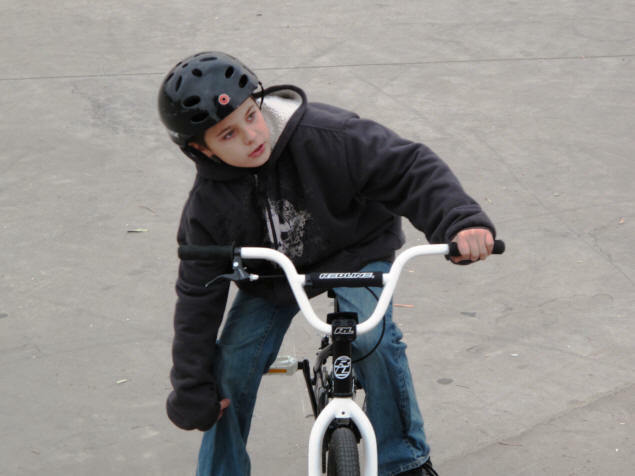 As previously detailed, my grandson Zach got a BMX bike for Christmas. Such a present must be used to be enjoyed; so his mother and Michael took him to a nearby bike park for each of the past three days so he could practice doing stunts on it. Today Michael and I took him; and of course, I brought my camera. 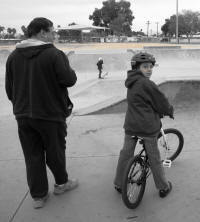 The place we went is calledReed Park, part of the Mesa Community Park system. 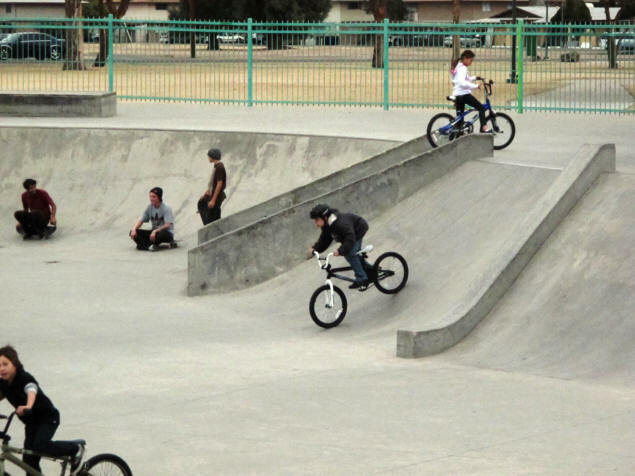 This is a very cool park with a large skateboard court that is open to bikes and blades as well as boards. It's located at 1631 E Broadway in Mesa, AZ. We arrived after I got off work, late afternoon when it was still warm enough to be pleasant yet cool enough to suggest a jacket even for a biker. 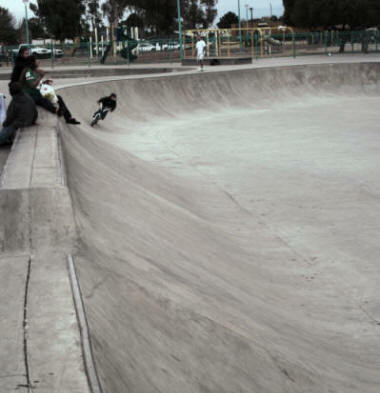 The skate park is enormous. I understand from my friend, Jack, that it used to be a lake near which bodies were frequently found. So the lake was drained and cemented and now the only bodies are from skating mishaps. Actually, though, the majority of users on this day were bikers; and Zach's bike immediately garnered attention. We weren't there five minutes before a toothless young dad expressed admiration and asked how much the bike cost. "I have no idea," I replied, honestly. "His mom bought it." "Gotta be $500-$600," the dad said. All I could do was shrug. And determine to keep a very close eye on Zach and his bike while we were there. Zach wasn't worried about any of this, however. 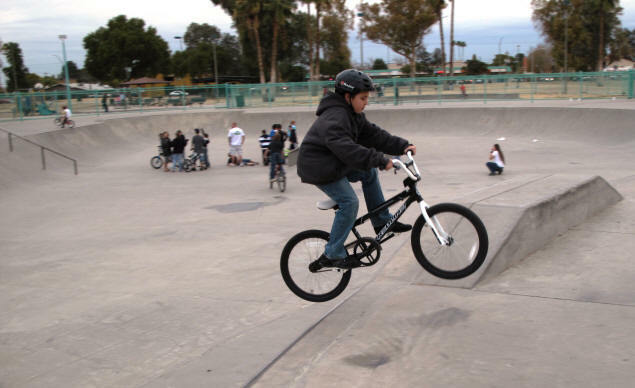 He headed straight for one of the ramps and flew into the skate park. He rode around a few times to warm up. Finally ready, Zach tried his trick: Riding very fast up the ramp and into the air before hitting the ground at the top. Adding to the fun was a crowd gathered at the other end of the skate park. Zach pedaled over to see what was going on. It turned out the kid on the ground had broken his leg. His parents weren't there, but in these days of cell phones they are never far away; his father arrived mere seconds ahead of the paramedics. Zach hung around just long enough to determine there was nothing he could do to help, then returned to the task at hand. 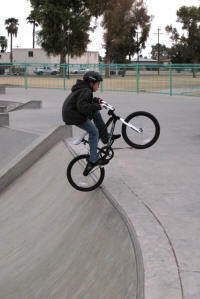 While the paramedics carried the kid with the broken leg away on a stretcher, Zach practiced his trick over and over. Note that this was only his fourth day trying it, and he had only been here an hour or so each of those earlier days. Yet his years of karate and mixed martial arts training have certainly paid off, in that Zach has learned to focus, practice, and allow himself room for improvement. And so, before we left, he was able to grab even more air than before. Finally it got too dark for clear photos; so we packed up and left. If Zach can do this with four days' practice, imagine where he'll be by the end of 2010!